Oh! Calcutta moved away from their buffet lunches and instead launched a gourmet platter for the lunch hours. They pamper you with three different starters, a mutton dish with poori, two types of fish entrees with steamed rice, and a couple of desserts at the end. You need a good appetite to finish that. 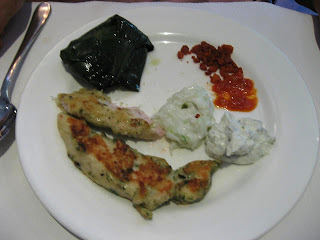 The first starter was the Murshidabadi Murghi - a special batter-coated chicken - named after a town popular for its unique silk saries. The second was the Gandhoraj Bhetki - fish coated with a fine paste of mustard and gandhoraj (a variety of lime sourced from Bengal that literally means 'the king of aroma'!) before being delicately cooked. The last starter was the Kachra-Chingri Bhapa, crab-meat and minced prawns mixed with spices and steamed inside a banana-leaf. The accompanying chutneys were excellent - one made of tamarind, another of tomato and mustard paste, etc. 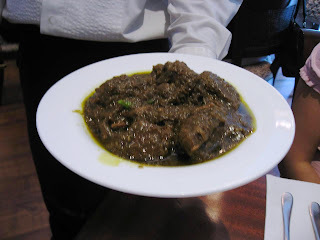 The Kosha Mangsho is a personal favorite. Even though it was very heavy and oily, I ended up scooping up a considerable portions of this mutton dish - made in a very thick gravy- with the accompanying pooris. The Macher Jhol, a staple in Bengali fish preparation, was a different version - made in a tomato based gravy. 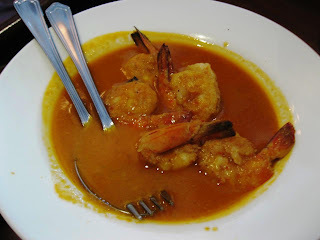 Finally, the Chingri Macher Malai Kari, or prawns cooked in a gravy of coconut milk and delicate spices. Both were reasonably ok, but the highlight were the starters. Desserts consisted of mini Roshogollas and Malpua - again not particularly remarkable. The restaurant is also running a Ilish Festival - a fish that is particularly sought after in Bengal. The restaurant sources it straight from Bangladesh; the best Ilish are found in the River Padma. As you can imagine, that makes the prices for these prized dishes quite steep. Also, non-Bengalis be warned! The Ilish is filled with thin bones that needs expert handling. 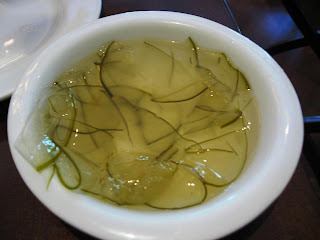 If you wish to try this fish, order the few boneless dishes on their special menu. The fish, incidentally, is incredible and very different from any other. Note: Dec 2009 updates on Pune's newest dining spots is posted here. Having moved into Kalyani Nagar recently, I was hunting for new home-delivery options. Turns out there is a new kabab place in town, actually right in the heart of Kalyani Nagar where Casa de Goa existed before. Kabab King has a chef from Lucknow and an imposing menu that covers a lot of ground - from Lucknow to Hyderabad. The two kababs we ordered: Murgh Kali Mirch and Shahi Murgh Tikka were both better than those available from run-of-the-mill kabab places. Promising find; lucky me! Kabab King is located next to the Lifestyle mall in Kalyani Nagar in Floriana Estates. Ph: 3234-1333. Apr 2009: Indus Kitchen, Addah, etc. Yes...you should get your own column in a newspaper soon. People talk a lot of the swine flue here in Canada, especially with school starting again next week. But deep down, I doubt most people care... it's mostly the medias. @Zhu: The high rate of deaths among young people has been a little alarming. Also new Tamiflu-resistant mutant viruses are being reported from parts of the world now. @All: BTW, for a different perspective you may want to check Uttiya Das' detailed critique of Oh! Calcutta in the comments section here. Also, for those interested in Kerala food, there is a special Sadhya feast during Onam on September 2. Enjoy! Long deserved. Thank you. Thank you. Thank you. I always needed a foodie to tell me where to go for eating in Pune. Today I took my wife to "The Courtyard by Marriott ". At last . Finally. I was so much eager to visit the place after reading your blog. I would say for the first time my wife enjoyed the buffet so much. Needless to say about myself. 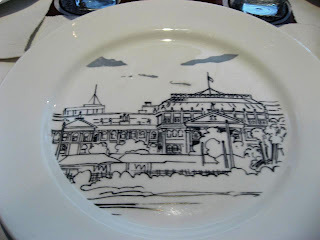 Excellent food, such delicacy, loved each and every dish and pleased with the courteous and helpful staff. On the way bought some pastries for my son. Planning to visit again next month on my birthday. Thanks a lot for introducing such lovely place. Before going to "The Courtyard by Marriott" today, I was thinking of visiting Le Royal ( not certain about the name, same locality ) , who have cut down prices to half and to go The Courtyard by Marriott " on birthday. But on second thought I could not resist myself. I must stop visiting your blog late in the evening after drinking... want to go for a curry!!! Not too may options here in Oslo!!! 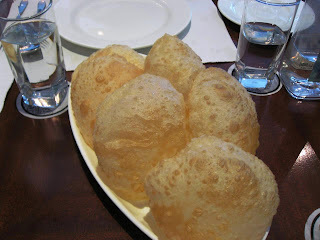 Aaah...Poori and mutton...Where the Bong in me fights with the Mallu - and wins! @Srinivas: Welcome here and thank you very much. @Priyadarshan: Glad you enjoyed your lunch experience. @Beaverboosh: Why don't you plan a trip to India? @Vincent: Thank you! I will look up the site. last week, we visited Oh!Calcutta to feast on their Hilsa Festival. Hilsa is my favorite fish, so we friends thought to give it a try. What i didn't knew is that surprises waiting for me there !!! The Menu read some rare delicate preparations of Hilsa fish which was unknown to my half-bengali taste-bud. So, i thought to bypass the popular-homely affair of "Shorshe Ilish", "Bhapa Ilish" and have those rare delicacies. But i sticked to my starter of "Ilish maach bhaja". Then we ordered "Ilisher Dhoan Paturi", "Aam Tel Ilish Lau-pata Bhaate", "Poshto Ilish" and "Tetulpata Ilish". 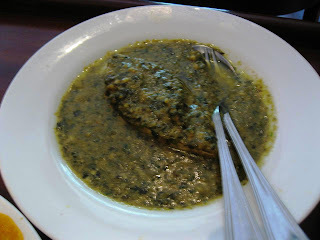 It said to have brought Padma-r Ilish. And a Bengali only knows the difference between Padma-r Ilish and Ganga-r Ilish. Most dishes were good. i found "Poshto Ilish" and "Tetulpata Ilish" not that good a preparation. specially in "Poshto Ilish", the flavoured mixture of curd & poshto overpowered the own-smell of well-cooked Hilsa Fish, though my Mom loved it in their Delhi branch. But it was ok. "Tetulpata Ilish" didn't go-well with my Half-Bengali taste-bud, it could have been a hit with my Half-Punjabi taste-bud the way it was presented & the unique smell of Hilsa with Tetul. But the hit-of-the-evening was "Ilisher Dhoan Paturi" and "Aam-Tel Ilish Lau-pata Bhaate". The "Ilisher Dhoan Paturi" was just out of the world, the fish so well messed with the mashed-brinjal, mustard, tomato that it tantalised my taste-bud to have one-more !! Even the "Aam-Tel Ilish" tasted heavenly. I loved the dish, so well cooked with mango-pickle oil & spices, tasted just amazing. This is the 1st time that i am full of praise for Mr.Anjan Chatterjee's Oh!Calcutta and hoping to visit again at their Kolkata Branch with Mom & Dad this Durga Puja. I want to know your take on this unique preparations if you visit the Festival. Hoping to hear from you soon. and one more thing, i had a lunch buffet at Oh!Calcutta-Pune in the beginning of this month, there i found "Kancha Lonka diye Murgi". 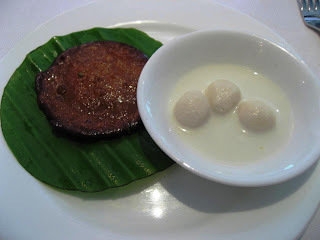 I must say it was very-well prepared like my 1st Oh!Calcutta experience way back in 2004 at Bhawanipore-Kolkata. It was a very nostalgic moment for me as i kept saying to my friend that it tasted exactly the same when i first tasted it then. The first Oh!Calcutta dinner with my family in Kolkata was a full-fanfare which comprised "Kancha Lonka diye Murgi", "Bhapa Murgi", "Chingri Malai Moili", "Kankra-r Jhhal", "Daab-Chingri", "Ilish Maachher Paturi". And i am happy that i found the same taste here in Pune after so many years. The buffet also had "Fish Finger" which i found very-good. Meanwhile i just returned from Bangalore, there i discovered BHOJOHORI MANNA at Koramangala. 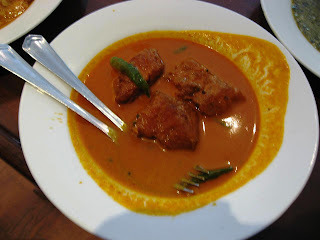 They brought their signature dishes of "Mutton Dakbangla", "Goalondo Murgi" to Bangalorean Bengalis. I found their "Maachh diye Potoler Dorma", "Kanchkolar Kofta", "Chicken Faridpuri", "Pur Bhora Bhetki", "Chingri diye Mochaar Dal", "Barishali Ilish" to be excellent. Finally, Bangaloreans to get the authentic bengali taste. you are much more a food-connoisseur thn me ! !